Reader’s Digest: The Canadians at War 1939/1945, Volumes 1 & 2. Everyday Heroes: Inspirational stories from Men and Women in the Canadian Armed Forces. "…By the time we reached Nantes we were pretty bushed. Although the squadron had done well (shot down or damaged over 30 German aircraft) we had also been badly mauled. Seven pilots had been killed, two wounded, one had a mental breakdown and our CO was missing. Most of the patrols were now being led by myself or Willie McKnight, who had just won himself a DFC. Willie was 21, a wiry, dark-haired little guy from Calgary, and absolutely fearless. After the Dunkirk evacuation we’d been sent to France to operate from an airfield just south of Paris. The battle by then was so confused it was often difficult to tell friend from foe. One evening. just before dusk, my wingman and I went after a Dornier bomber. it was too far ahead to catch, but by the time we turned back, we didn’t have enough fuel to reach our base at Chateau-dun. We landed in a wheat field, and, as we climbed out of the hedgerows and came at us, yelling and brandishing scythes and sticks. It was touch-and-go to convince them we were on their side. Another night we had trouble with fifth columnists. A couple slipped past our guards and turned on the yellow lights in the Hurricane cockpits. We couldn’t see the glow from the ground, but it was visible from the air. Jerry came over and dropped incendiaries, but fortunately there was no damage. On June 14th, the day the Germans held a victory parade in Paris, we flew to nantes on the west coast with two other squadrons. Our job was to fly cover over the evacuation ports of Brest and Bordeaux, keep tab on German movements and destroy supply dumps and other targets. Our ground crews had been evacuated so we had to fuel and arm our own aircraft, do spot servicing, then get back in the air. At night we slept under our planes and took turns on guard. One evening we went into nantes, and soon wished we hadn’t. As we came out of bar we were sniper at, probably by another fifth columnist. We bet it back to the airfield and found the canteen tent abandoned. It was loaded with liquor, so we had a party. Willie McKnight, I remember, refused to drunk from a glass. Whenever he needed a drink, he reached for a bottle, smashed the neck and took it straight. The day France surrendered, French soldiers set up machine guns along our runway. “All aircraft are grounded,” an officer told us. “There’s to be no more fighting from French soil.” We saw red. A brawl was threatening when I felt a tap on my shoulder. Behind me was a British Army officer, who had come seemingly from nowhere. “Go ahead and take off.” he said to me, “I’ll look after these chaps.” He pointed to his platoon which had set up machine guns covering the French weapons. The French officer shrugged and left. Time was running out. The Germans were over the LOire River and heading towards us. Un June 18 we flew a last patrol over Brest and made a couple of sorties inland. Flying back from one, I saw a small British armoured car racing down a road. It stopped at a crossroads, seemed to hesitate a moment, then took up a defensive position. It was all alone. The only troops nearby where in a German armoured column advancing towards the crossroads. 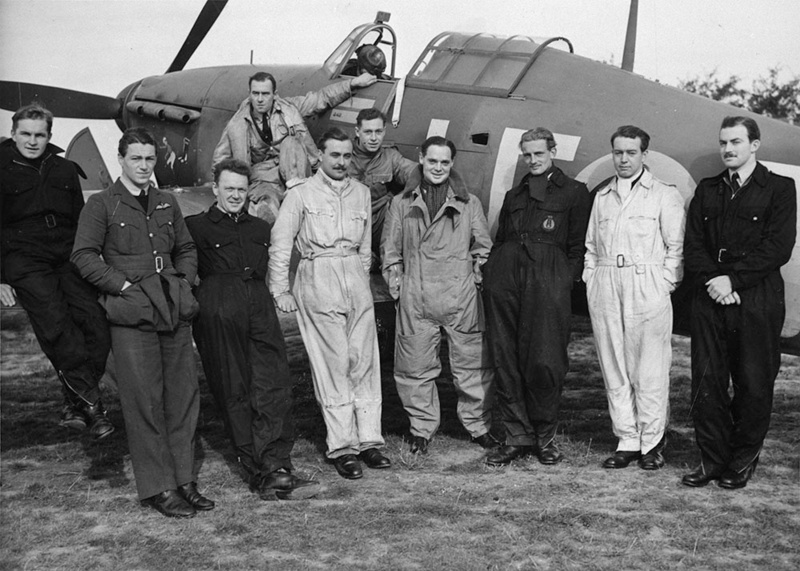 (Stan Turner resting his arm on his Hurricane after landing in Fowlmere in September 1940. By wars end he was a group captain in command of an RCAF wing in northwest Europe. 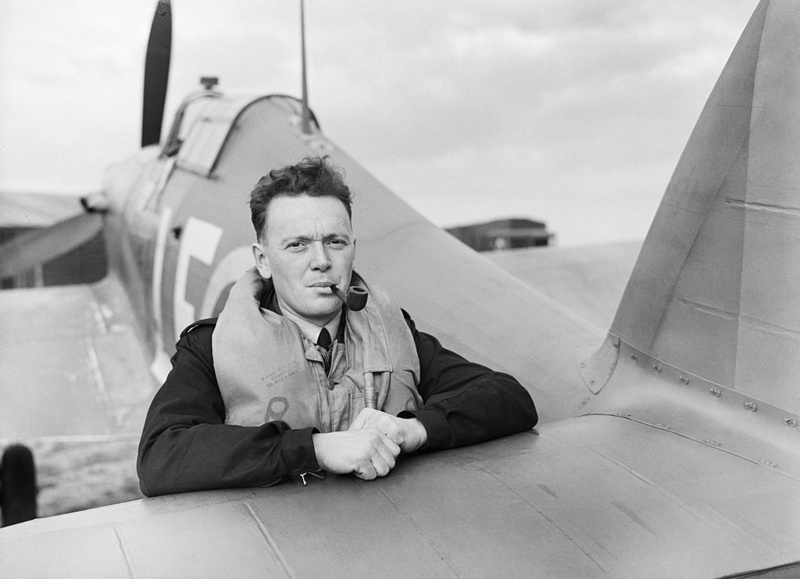 He would go on to fly over the skies of Britain, Malta,the North African desert, and was a wing leader in Italy. One of the few allied airmen to fly in so many different theatres and survive. He shot down at least fourteen enemy aircraft.